How do you check the pulse of your innovation process? Well, I like what GE’s Jeff Immelt says in Game-changer: You known innovation is taking root when there’s rhythm to the review of projects and rigor in the milestones they must meet. If I were to probe only one thing in an organization’s innovation process, I would sit through or perhaps walk-through its innovation review. Everything from who are the reviewers, what is being presented, the nature of the questions, perceived seriousness of implications – all these would send vital signals. Let’s look at how P&G conducts its innovation review as described in Game-changer by A G Lafley. · Homework before the review: AG points out an important pre-requisite before beginning any innovation review – the business team must have already completed the hard thinking in two areas: clearly defined business growth goals for a minimum of 3 to 5 years out; and clearly defined “where to play” choices or business strategies. · Who attends: All critical leaders - CEO, Head of business, Head R&D, Head of design, Head of consumer understanding. How robust is my portfolio to deliver my goals? Judgments need to be made if there is a right balance of risk in the portfolio. This can be assessed by understanding if you have a big idea. Analyze the data showing how customers (the boss) respond to the idea. Is the proof data-rich or based on people’s opinions and experiences? Does the team know how to make the product? Do we have the right kind of patents? How well does the plan leverage core strengths? What types of help might be needed from outside the business unit? How strong is my innovation plan compared to key competitors? This question requires benchmarking, forcing teams to look externally at what’s happening in the marketplace. It helps assess key competitors’ strategies. Understand in which area they are filing patents that may impact the team’s freedom to innovate. How attractive is my innovation program from financial and return standpoint? Can the innovation be commercialized with a cost structure that enables the right balance between margin enhancement while also providing the customer a good value? Does the innovation portfolio as a whole provide a good return on investment? 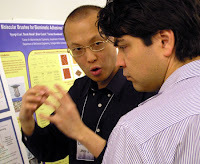 · Methodology: The review happens through poster presentations similar to grade-school science fair. Why posters? Because these reviews are full of scientists, and the posters force the scientists to speak in terms that the senior management can understand. They also drive focus and simplicity. Often, the discussion also involves show-and-tell – where people get to touch and use a product or key technology element. Over a period of a few hours, the group can go through a dozen or so innovation projects. I have a deep-rooted fascination for legendary practitioners who preach what they practice and vice versa. For me to find such a person, 4 things should happen: (1) This person should have been a hard-core practitioner contributing significantly to the practice (2) He should have written about the principles, methods and tools that he practices (3) He walks the talk; and (4) I come across, comprehend and appreciate his message. While there may be many who qualify criteria (1) and (2), criteria (3) is very demanding and (4) needs a lot of luck and carries the gravity of my biases. So far I have come across following legendary practitioners: Ramana Maharshi, Warren Buffett, Mahatma Gandhi, Thomas Edison and A G Lafley. This week I discovered another in this category: Dr. Joseph Juran, the architect of quality through his autobiography. What did I find so fascinating about this book? Let me articulate three things. · Brutal honesty of narration: When you are a legend, it is easy to write with a tone, “What did I do right to become great?” However, it is much more difficult to look at the movie of your life dispassionately and avoid the blame-game. For example, Juran narrates a story when his career seemed to have hit a plateau at Western Electric (an AT&T company). This was the first time in his career that a vacant slot above him gets filled by someone other than Juran and it shattered his belief that promotion is an entitlement. It made Juran to go into a “revenge” mode for some time. Looking back after 60 years, Juran tries to answer: “Where did the revenge emotion come from? What did I not understand at that time?” In this process, he uses data he gathered from his bosses and subordinates much later on the perceptions people carried about him (tactless & arrogant). I found this approach of writing impressive. · Evolution of “process capability” as an idea: One of the core contributions of Juran is the concept of “process capability”. It was a radical innovation that demonstrated that you can improve productivity systematically without adding any machinery, workers or material. It made a huge impact in Japanese industry in 50s and 60s, for American industry in 70s and 80s and to the rest of the world later. Juran traces beautifully the conception of this idea, difficulties faced in getting it adopted in his own organization, role of professional societies like Society of Advancement of Management (SAM), American Management Association (AMA), Japanese Union of Scientists and Engineers (JUSE) etc. in spreading the idea and the role of consulting projects and books Juran wrote in establishing the idea. · A powerful lens to look at last century: Juran came from a Jewish immigrant family and lived for 104 years (1904-2008). His first ten years were spent in poverty and he lived in Minneapolis’s red-light area for 4 years with his dad after his mother’s death. His first car was Ford Model-A (bought in 1929), his company’s strength came down from 40,000 to 7,000 during Great Depression (he survived the lay-offs), he was engulfed by fears of anti-Semitism during world war-II, he decided to become a freelance consultant when it wasn’t an established practice (1945), in 2001 Juran celebrated 75th wedding anniversary with his wife Sadie. Juran wrote the last chapter of this book in 2003. This vast canvas makes the book an amazing lens to look at the last century. I recommend this book to anyone interested in any of Business history, Quality, Management, Innovation and Consulting. In India it costs just Rs.359. In all likelihood, I will re-visit this book for years to come. I wrote about the INSSAN Convention I attended last week where shop-floor innovators were the heroes. What were the sources and types of these innovations? What kind of analysis was involved in coming up with solutions considering? What kind of cost was involved? And finally, what did I not see in the convention? Let me articulate what I observed. Sources of innovations: Most innovations involved observing a problem area or an improvement opportunity in the plant set-up. These included high frequency of wear-and-tear or failure of critical components (e.g. bearing), oil or gas leakage, inability to manage sudden surge in demand (e.g. sudden demand for 20-pack cigarettes in Godfrey-Philips), human fatigue in certain process steps (e.g. actuator mounting at a BHEL plant), hazard exposure, delay and/or high cost in distribution channel (e.g. forex cost for transfer from oil refinery to retail outlets of BPCL), saving of carbon emission, sourcing new machines locally instead of importing the expensive ones (e.g. at Godfrey-Philips the design change involved 195 spares and sourcing it locally and assembling together). If we look at “Pain-wave-waste” as three main sources of innovation, then these innovations were related primarily to “waste”, some to “pain of employees” and a few to a wave especially “Go green”. I didn’t see any innovations which were linked to consumer research data or consumer complaints (customer pain). Similarly, I didn’t see any “competitor analysis” (why don’t we do this?) or “macro-trend analysis” (social, technology, regulatory waves/trends). Analysis techniques: The most common analysis technique used by the innovators was “why-why” analysis. It is a technique where you start with a problem and repeated ask “why?” until a root-cause is discovered. I feel it is a simple and yet very powerful technique. Note that many of the innovators were not graduates and some presented their innovations in Hindi. However, their slides were far better than what I have seen in high profile conferences. Second most popular technique was “Pareto analysis” (80-20 rule) to figure out which 20% things are responsible for 80% of the problems. I didn’t see much collaboration outside the department (let alone the organization) in coming up with a solution. That is far cry from companies like P&G (For example, see here the players that collaborate in P&G’s idea funnel). Types of innovations: If we use the BusinessWeek classification of 4-types of innovations, then most of the innovations were of type “process improvement” (no surprise here). Some of the process improvement resulted in improving product quality (“product axis”) and occasionally improved the customer experience. Only once I saw the innovation involved optimizing the delivery channel. My favorite practice: I found Mahindra & Mahindra’s process different and interesting. For example, Mr. Desai from press-shop said that he is part of Everest team which met 12 times a year, came up with 1265 ideas out of which 1020 ideas were implemented. This meant a run-rate of 11 ideas per person per year. The team would identify a challenge such as “reducing input material cost” and work as a cross-functional team to address the challenge. The team demonstrated that input material cost can be reduced significantly by re-using scrap material. There are many forums where “man on the top” is celebrated. But not many where “man on the spot” – innovators at the shop floor carrying designations like technician, utilities operator, maintenance operator are celebrated. Indian National Suggestion Schemes’ Association’s (INSSAN) 20th Annual Convention held in Mumbai last week was one such forum. Personally it was a humbling experience for me. Guess how many ideas Srinivasan has suggested that have been implemented? A whopping 5792 ideas over the last 6 years saving TVS Rs. 4.86 Crores! He has won best suggestor award 6 times at TVS and also has traveled twice abroad to attend international conferences. Srinivasan was one among 60 to present his idea in the INSSAN’s Convention. The innovators had come from all corners of India like Jamshedpur, Trichy, Vizag, Belgaum, Hosur, Bhilai, Gaziabad, Delhi, Ankaleshwar, Silvassa, Thal, Khopoli, Kandivli, Pune etc. Participating organizations included PSUs like BEL, BHEL, BPCL, RCF, SAIL and private companies like Coromandel, Hero Honda, IPCA Labs, Mahindra & Mahindra, Sterlite Industries, Tata Power, Tata Motors. The only high-tech company represented was Bharat Electronics. Following sectors were missing: Retail, Hospitality, Healthcare, IT, Education, Telecom. TVS also happens to be leader in India when it comes to idea per person per year metric. In 2009, on an average every TVS employee suggested 44 ideas as compared to an average of 5 ideas per year over 28 companies that participated in the survey. That is close to 10 times the average! You ask the TVS folks and they say, “We are very serious about this process and every quarter review our progress. Last year, every employee carried a goal of 36 ideas for the year”. Suggestion schemes in India are over half a century old, perhaps tracing their origin at Tata Steel, Jamshedpur. Unfortunately, we don’t have any literature which tells us why some suggestion schemes in India have survived and thriving while others have died or undergone multiple birth-death cycles. Kudos to INSSAN organizers for creating a platform where we celebrate “men on the spot” and appreciate their ideas! In spite of owning a few hundred patents Edison struggled to make a profit from his electricity business. We called this paradox – patent paradox. Interestingly, Edison could never solve the patent paradox. In the subsequent business of phonograph where his company was the leader for the first half of the first decade in the 20th century, he lost the lead to the rival Victor Recording Machines never to regain it. Around the time Edison was spending time & energy in patent battles in 1880s, another entrepreneur was also doing the same in a different business. The person was George Eastman and the business was photography. However, in contrast to Edison, Eastman was to establish a brand called Kodak that would create monopoly lasting close to a century. What did Eastman learn and do that Thomas Edison didn’t? Let us explore. When George Eastman quit his school to start work as an office boy in 1868 in an insurance company at $3 a week he was fourteen years old. And when Eastman quit his job at Rochester Saving Bank in 1881 he was getting $1400 a year. By then his photography business was already 4 years old and he was ready to “put all his eggs in one basket and then watch that basket”. He purchased his first camera in 1877, it cost him $49.58 and he had to pay additional $5 for lessons. With tent-load of equipment carry and knowledge of tedious film development procedure, photography was either a professional business or at least a serious hobby. Initially, Eastman and co concentrated on developing and patenting what they viewed as the three basic elements of photography: the film, the process of filmmaking and the roll holder. He also went at great lengths to buy patents of others. Eastman entered into pools to control price and output. Until 1887 or 1888, Eastman and his employees were working so intensely, especially on the delicate problems involved in the preparation of emulsions for coating plates or film that there was no time for the big picture. Eastman pushed his colleagues with such forcefulness that a rather large number of them collapsed under strain. What happened next is no less than a “paradigm shift”. Eastman began working on a simple camera which targeted mass market in the summer of 1887. By December, his “little roll holder breast camera” was ready for a name. He called it Kodak. He wanted a brand-new unique word in order to meet the trademark requirements in England; and he also wanted a word easy to pronounce. Including the case in which it was sold, the new Kodak was 6.5 inches by 3.25 inches by 3.75 inches. Price: $25. And Eastman wasn’t just selling the camera. He was selling a service as well. The $25 camera came loaded with a roll of one hundred frames of unexposed film. Taking the photograph was as easy as pushing a button and turning the key for the next frame. When all one hundred frames had been exposed, the photographer sent the camera back to Rochester when Eastman Kodak Company unloaded it, developed pictures, reloaded the camera and sent the pictures and the camera back to the customer. Price for this service: $10. Eastman created a unique customer experience and associated it with a brand name called “Kodak”. In fact, Kodak later launched a brand campaign: “You press the button, we do the rest”. Not every problem needs a technical solution; something Edison never understood.